Don’t get me wrong, your Job Cost Reports provide you with absolutely critical information about all kinds of things: cost overruns, where you are at on the job as far as completion, and how well you estimated the job and a host of other things. These reports are what Contractors tend to focus on because it all MAKES SO MUCH SENSE. It’s completely relatable in your everyday operations and zone of genius. In my previous articles in this series: Margin vs. Mark up for Contractors, Why Your Profit and Loss Report Makes No Sense and How to Fix It and Assigning Overhead Costs to Jobs – Don’t Do It! I talk a lot about the Profit and Loss report and how important it is to regularly analyze and understand not just your job cost reports, but your FINANCIALS. When it comes to “Financials” the report most people feel pretty comfortable with (although often fraught with issues, which I talk about in Assigning Overhead Costs to Jobs – Don’t Do It! ), is the Profit and Loss report. But, if you are just looking at your Profit and Loss Report, you are only looking at part of the picture. There’s this other report called The Balance Sheet and many businesses ignore this report completely, often because they don’t understand it, and sometimes because no one has ever explained it to them or what it means to them. 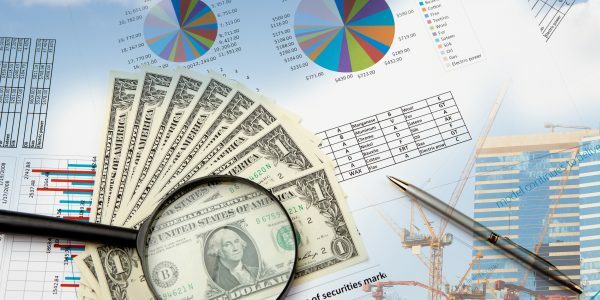 In this article, I’m going to break it down for you and help you understand a couple of the amazing insights your Balance Sheet can provide you with. As you are likely aware, the Profit and Loss Report is all about your Income and your Expenses. By looking at the Profit and Loss report, you can see how much income you earned during a certain period, how much your costs were during that period, and how much profit you made during that period – the last part – your net profit is what we tend to focus on – how much did I get to keep? However, the Profit and Loss report doesn’t tell you the whole story. First of all, if you have errors or mistakes in your bookkeeping, you are usually going to find them on your Balance Sheet! Did you know that every transaction in your company hits either your Profit and Loss OR your Balance Sheet, and sometimes both? 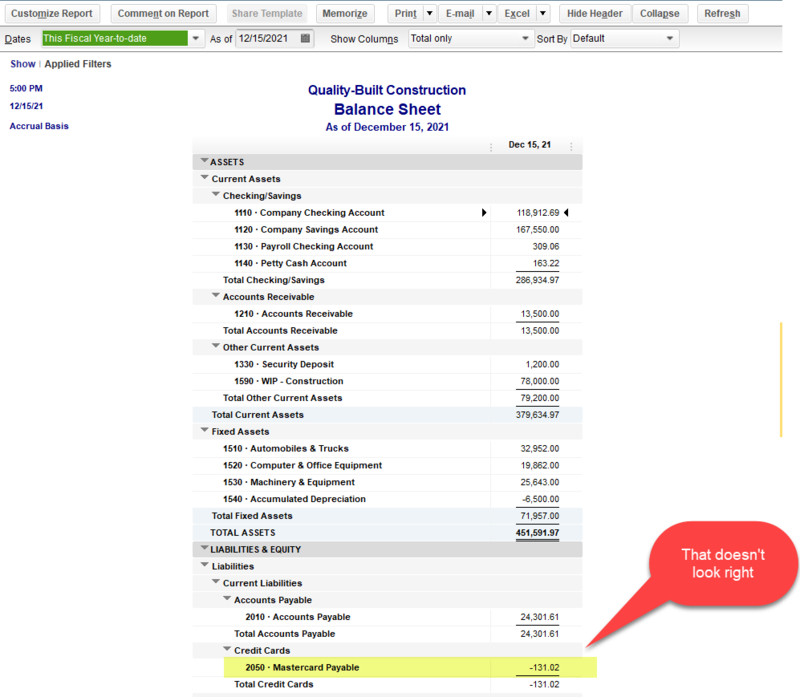 Oftentimes, errors are “hidden” on the Balance Sheet because you don’t look at it or don’t know what it means. Note in the below example, that account “2050 Mastercard Payable” has a negative balance – if I saw this on the Balance Sheet, I would definitely investigate further. It means you have either overpaid your credit card, or something’s not right – maybe all of the charges have not been posted. As a rule, the only accounts on your Balance Sheet that should have a negative balance are: Accumulated Depreciation and possibly the Equity accounts. If your Balance Sheet doesn’t look right, DO NOT IGNORE IT! Get help from your CPA, your bookkeeper, or ME. Secondly, your Profit and Loss report doesn’t tell you about the overall health of your business – it contains no information about your overall financial position – how much money you have in the bank, how much in debt you are, how much money people owe you and more. The other big difference between the Profit and Loss and the Balance Sheet is that the P&L displays information in a certain time frame, and the Balance Sheet displays information AS OF a certain date. From the Balance Sheet we can learn so many things. One of the things that people often find most confusing is the Fixed Assets – vehicles, equipment, buildings, etc. These are stated at their purchase price and will be offset by “accumulated depreciation”. Sometimes this doesn’t make a whole lot of practical sense because the market value of these things may differ greatly from this “book value”. Try not to get too caught up in this. While this part of your Balance Sheet does come into play in certain situations – when you are applying for a bond or bank loan, it’s not where you are going to focus your attention on a regular basis when it comes to practical, regular analysis in a small business. 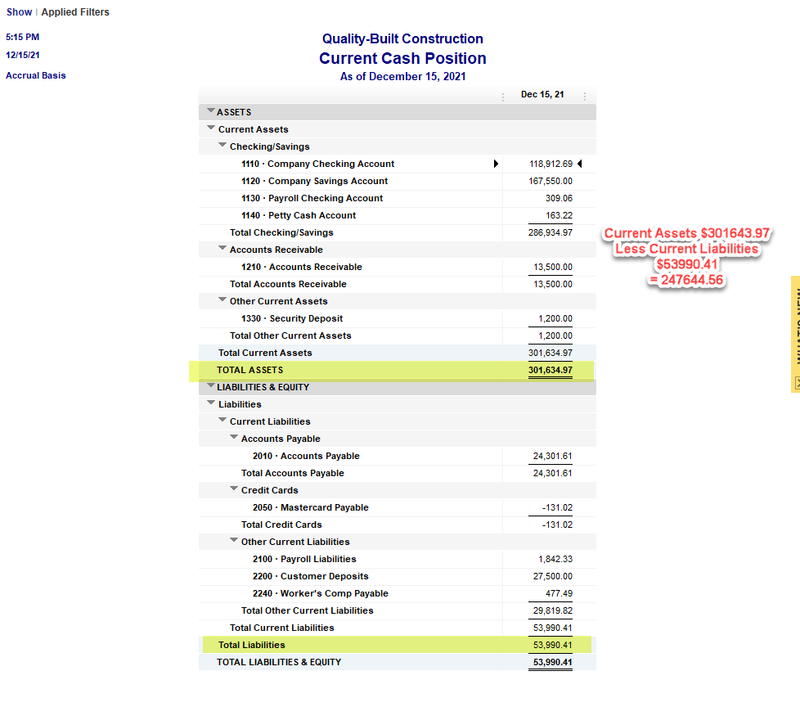 One of the most critical pieces of information that you can get from your Balance Sheet is what I call your “Current Cash Position”. This is super important because for banks and bonding companies, it signifies your liquidity – if something goes wrong, how much cash do you have on hand or can you come up with quickly to cover your debts and other liabilities. Bank or no bank, this is information YOU NEED TO KNOW! 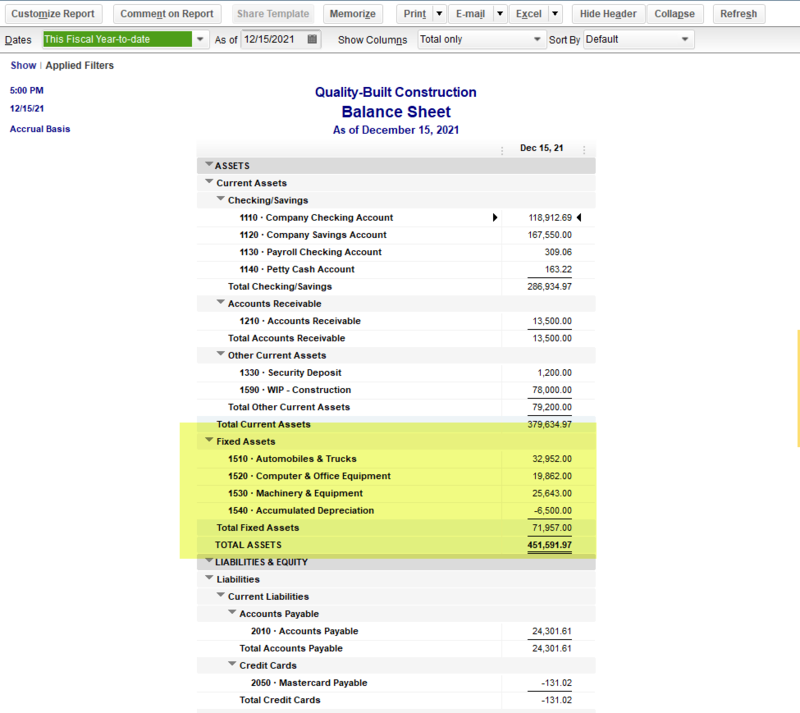 Oftentimes, for regular analysis of this, I’ll even create a modified Balance Sheet report for this purpose and filter the report to show only Current Assets (Cash on hand, Accounts Receivable, WIP/CIP, Retention, Undeposited Funds, etc) and Current Liabilities (Accounts Payable, credit card accounts, sales tax payable, payroll liabilities and customer deposits, etc). So what does this tell us? If we subtract our Current Liabilities – what we owe and is payable currently (usually 30-60 days) from our Current Assets (what we have on hand and will collect shortly usually 30-60 days), we’ll get our current cash position. In the example below, I’m doing great, I have a positive cash position of $247k. Of course, this information changes every day! Can you even believe that you haven’t had this information at your fingertips this whole time? Is there more to it than this? YES, lots of course, but, in my experience, from a practical standpoint, these 2 issues: Catching bookkeeping errors, and Assessing your Current Cash Position are the most important thing to look at frequently, many of my clients look at this report every week. In my Job Costing Intensive Program, I not only teach you how to get your job costing reports in order, but also how to adjust and understand your financial statements, and even how to calculate your mark up to make a profit. Are you working for a better future for yourself and your family or just working? If you’re like many (most?) contractors, when it comes to the financial stuff, you find yourself making decisions from more of an intuitive position than actual numbers and reports. You may feel uneasy or even deeply concerned about this, but try as you might, nobody can seem to provide you with information that makes sense. While maybe you will never relate to your financial reports at the same level as an accountant, you absolutely can and should be able to get sound reports that you can use to make sound decisions. You absolutely can learn how to analyze and understand your financial reports. Most people reach out to their bookkeeper or their CPA and find that this stuff is over the head of their bookkeeper and the CPA is just too tax focused and/or not interested in diving into this with you, and it can feel discouraging. That’s where I come in! This is my THING, and while I’m not a CPA, I can help you not only get your books in order, I can help you actually put the information in your accounting system TO WORK FOR YOU with my one on one Coaching and CFO services. Chances are, you’re intuition is pretty good, but what might you be missing and what would it feel like to know for sure? I can teach you how to understand the story your financial statements are telling you and give you the solid data in order to make better and more profitable decisions!